IT’S BEEN A HECTIC few years for the tramway system in and around Paris. In 2012, the tram lines T1, T2 and T3 were extended, in 2013 two new tram lines were opened, T5 and T7, and now, in December 2014, two more new tram lines come on stream. On Saturday 13th December, tram line T6 was opened and on Tuesday 16th December it’s the turn of tram line T8. I went to the opening of tram line T7 in November last year and last Saturday I braved the cold and the heavy rain and went to the opening of the new tram line T6. 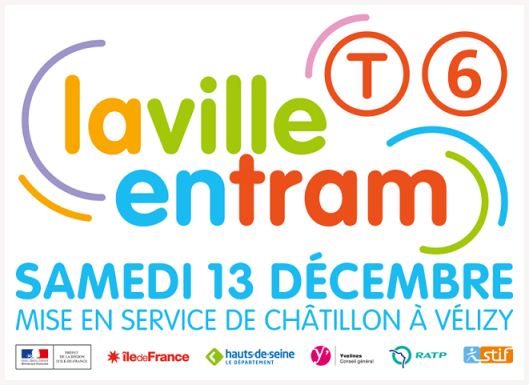 At the moment, tram-line T6 runs for 13 km from the Châtillon-Montrouge Métro station (Métro Line 13) to the tram stop Robert Wagner in Vélizy-Villacoublay passing through the communes of Châtillon, Clamart, Fontenay-aux-Roses, Meudon and Vélizy-Villacoublay, although Montrouge, Malakoff and Le Plessis-Robinson will also benefit from their proximity to this service. When the tram line is completed in the Spring of 2016, two further tram stops and a subterranean section of line will extend the tram line a further 1.6 km to Viroflay. 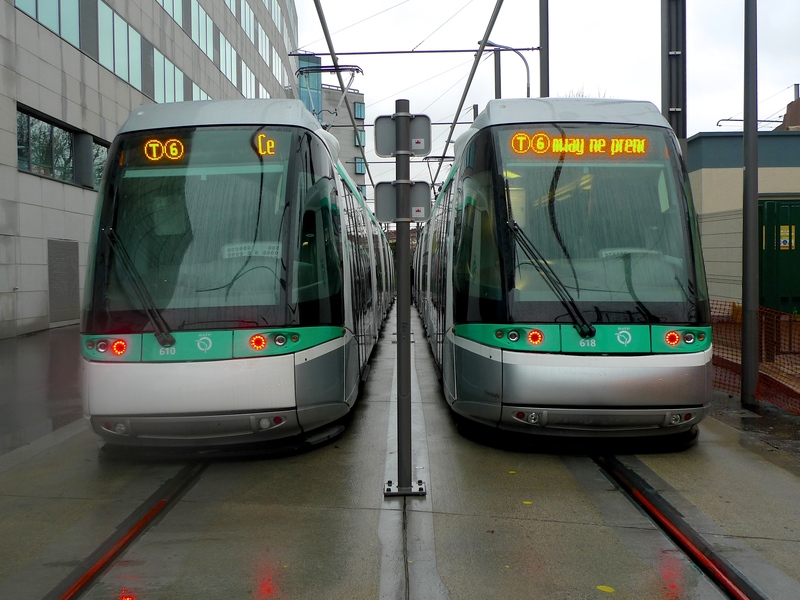 Tram line T6 has been designed to ensure easy transfers to Métro Line 13 (Châtillon-Montrouge), RER Line ‘C’ (Viroflay Rive Gauche), SNCF’s Transilien service (Viroflay Rive Gauche and Viroflay Rive Droite) as well as to several bus services at almost every tram stop. Building a new tramway is a very lengthy process and the planning for tram line T6 began back in the year 2000. 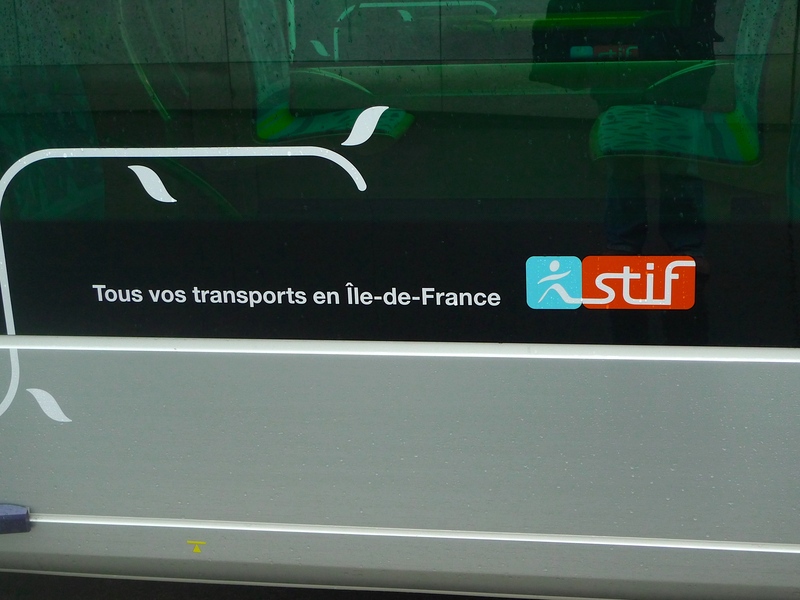 A proposal was put forward and accepted by the Syndicat des transports d’Île-de-France (STIF) in 2002. Preliminary studies and designs were carried out during 2002-2005 followed by a public announcement in 2006. 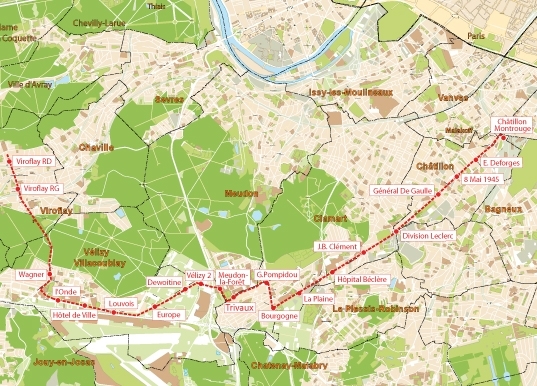 The cost of the project is around €385m excluding taxes and the cost of rolling stock and the project has been funded by the State (16%), Île-de-France (50%), Conseil général des Hauts-de-Seine (20%), Conseil général des Yvelines (13%) and RATP (1%). For the rolling stock, a contract worth €171.6m was awarded for the supply of 28 Translohr STE 6 type trams. Translohr STE 6 type trams at Châtillon-Montrouge on tram line T6. Note that there is only one rail per tram and the trams run on rubber tyres. 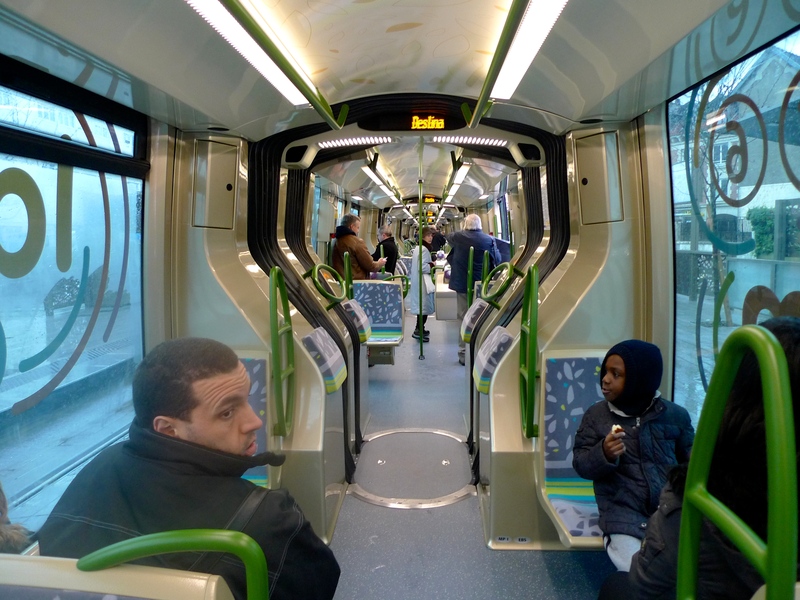 Each tram can accommodate 250 passengers, 60 of whom can be seated and the low floor facilitates easy access for passengers with restricted mobility. 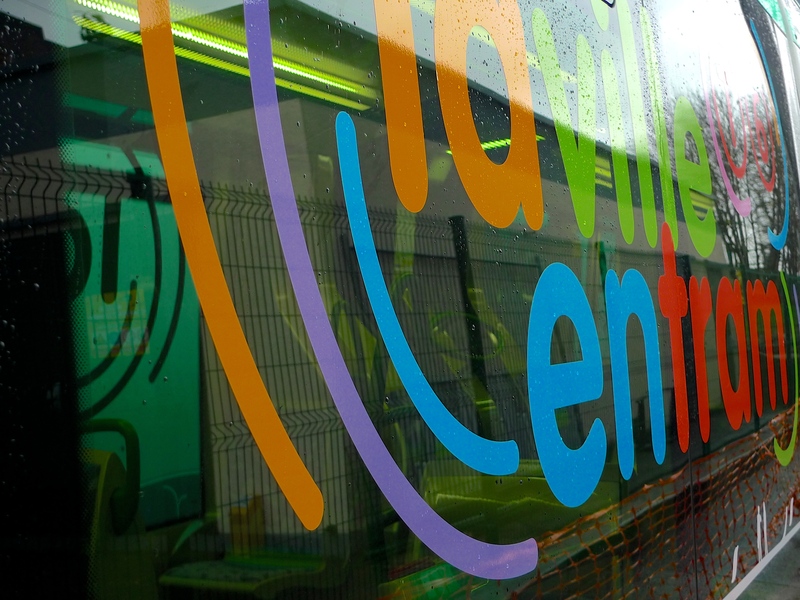 Other features include air conditioning, display screens and sound announcement systems. Tram line T6 operates from 5h 30 to 00h 30 seven days a week. The journey time is 40 minutes and the trams operate every four minutes during peak hours and seven minutes during non-peak hours. It is expected that some 82,000 passengers will use the line each day. 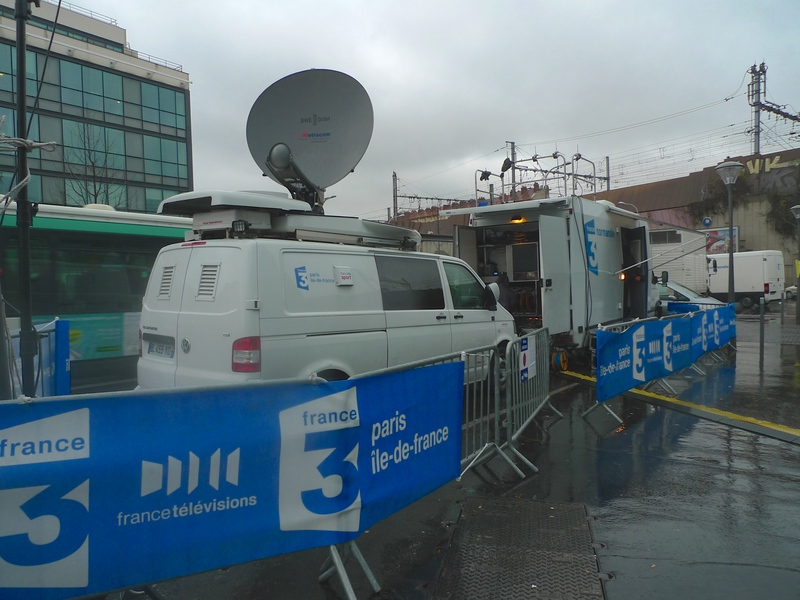 Arriving at Châtillon-Montrouge Métro station last Saturday morning I emerged into an unpleasant winter chill and very heavy rain. I’d arrived about half an hour before the opening ceremony was due to begin so I had time to look round. I came upon two brand new trams parked ready to be moved into position at the appointed time. As I walked past the TV tent with its attendant big screen TV outside relaying the live broadcast to those standing in the rain I came upon the Franco-Brazilian drummers, Batucada Zalindé. While they were playing, the two trams I’d seen earlier were manoeuvring into position by the station platforms ready for the opening ceremony. The opening of the new tram line was preceded by speeches from the assembled dignitaries, including Jean-Loup Metton, maire de Montrouge and vice-président du Conseil général en charge des Transports, Yann Jounot, préfet des Hauts-de-Seine, Jean-Paul Huchon, président du Conseil régional d’Île-de-France, président du Conseil du STIF, Pierre Bédier, président du Conseil général des Yvelines, and Pierre Mongin, président-directeur général de la RATP. 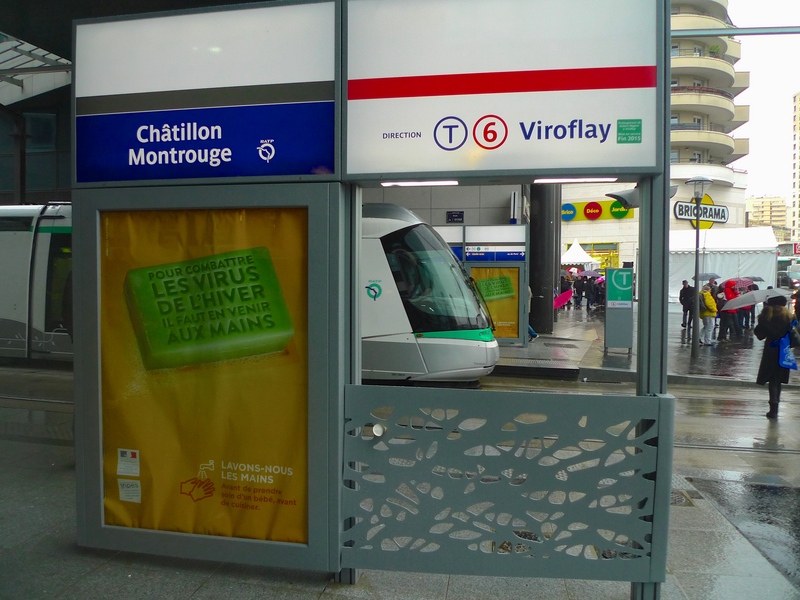 And then it was off to fight my way through the crowds to clamber aboard the first passenger-carrying tram to leave from Châtillon-Montrouge to Vélizy-Villacoublay on the now opened tram line T6. 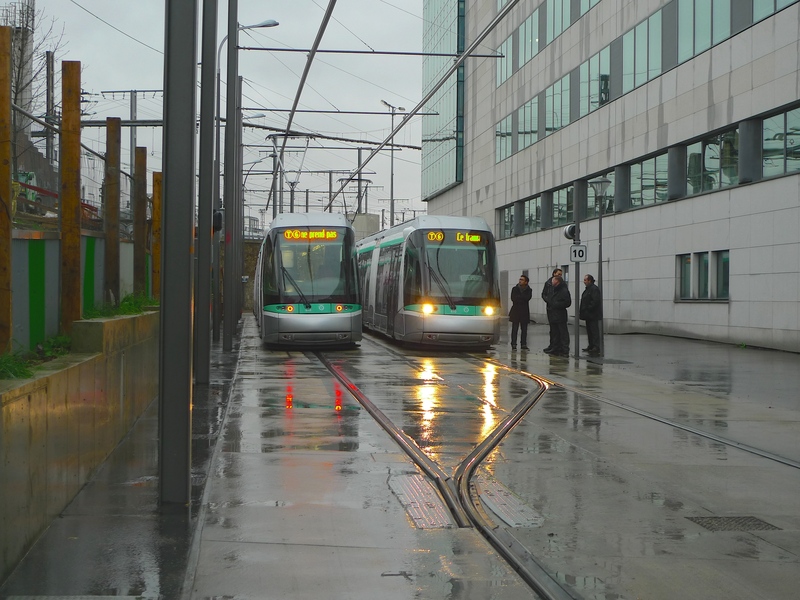 After leaving the Châtillon-Montrouge terminus, tram line T6 makes a sharp left turn and then heads off up a hill. I was impressed by the speed of the tram as it climbed the hill. The Translohr STE 6 trams can reach a speed of 40 km/h but I think the average speed on tram line T6 is around 20 km/h. 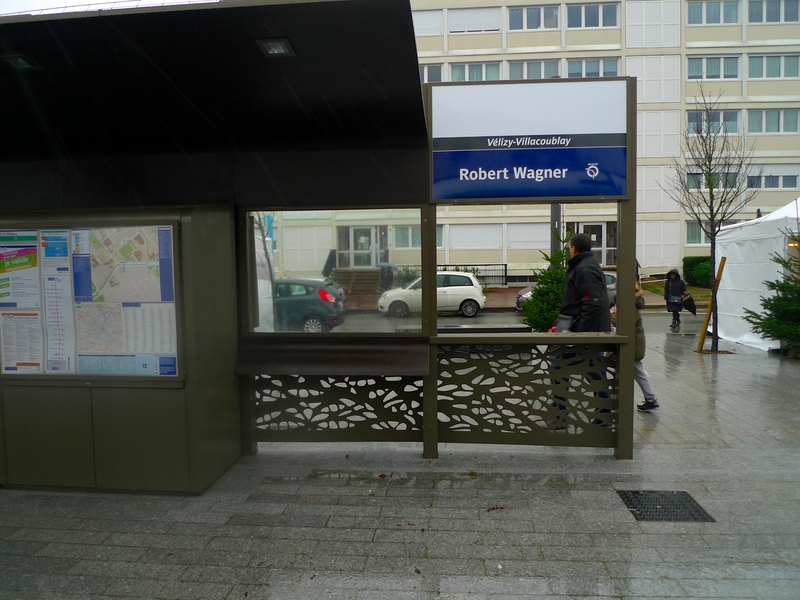 Forty minutes after leaving Châtillon-Montrouge we arrived at the tram stop, Robert Wagner, the current terminus in Vélizy-Villacoublay. Not all the passengers who got on at Châtillon-Montrouge travelled the full length of the line but those of us that did alighted at the Robert Wagner tram stop. There had been an opening ceremony at this end of the line too so some people went off to the marquees that had been set up to see what was on offer. I on the other hand, crossed the tram line and caught the next tram back to Châtillon-Montrouge. I recorded the sounds inside the trams for the full length of both my outward and return journeys. These of course are historic sounds – the sounds inside the trams on their very first day of operation and so they have been consigned to my Paris Soundscapes Archive and, in due course, they will make their way to my Paris Soundscapes Collection in the sound archives of the British Library. To give you flavour of what it sounds like inside a very full tram on tram line T6, here is part of the recording I made on the return journey, the five-stop section from Division Leclerc to Châtillon-Montrouge. 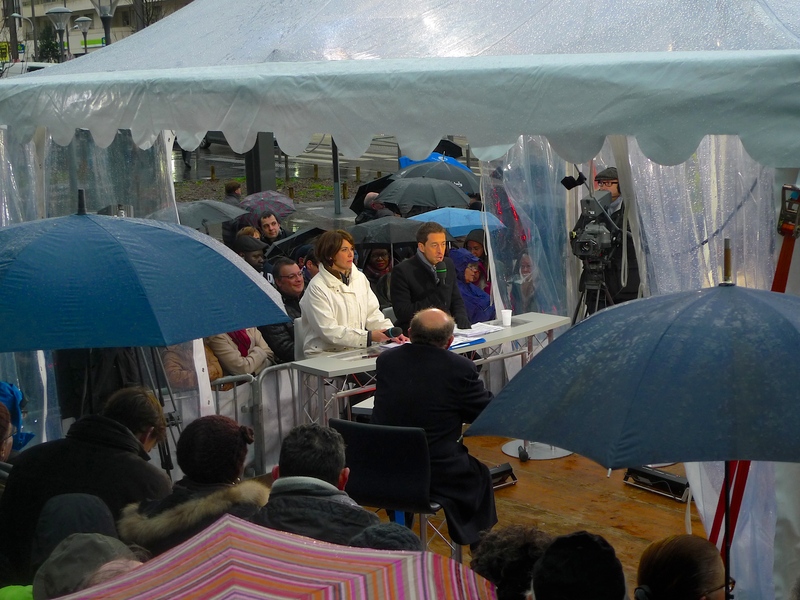 And when I arrived back at the Châtillon-Montrouge terminus the festivities were still under way, a band was playing – and it was still raining! 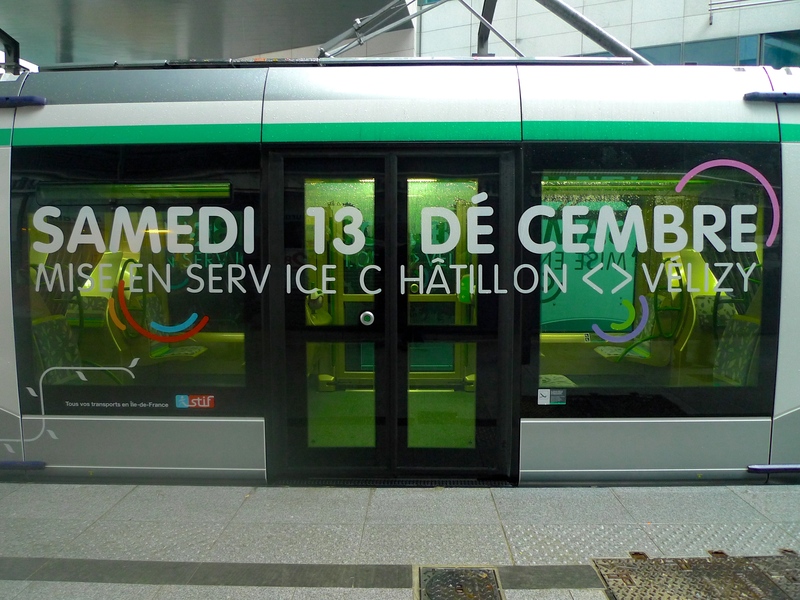 When the new Tram Line T8 opens on Tuesday 16th December, the Paris tramway system, extending into the Île-de-France, will stretch for 105 km. From the opening of Tram Line 1 in 1992 to the opening of Tram Lines 6 and 8 in 2014, a huge amount of money has been invested in the tramway system. And there’s the prospect of more to come. 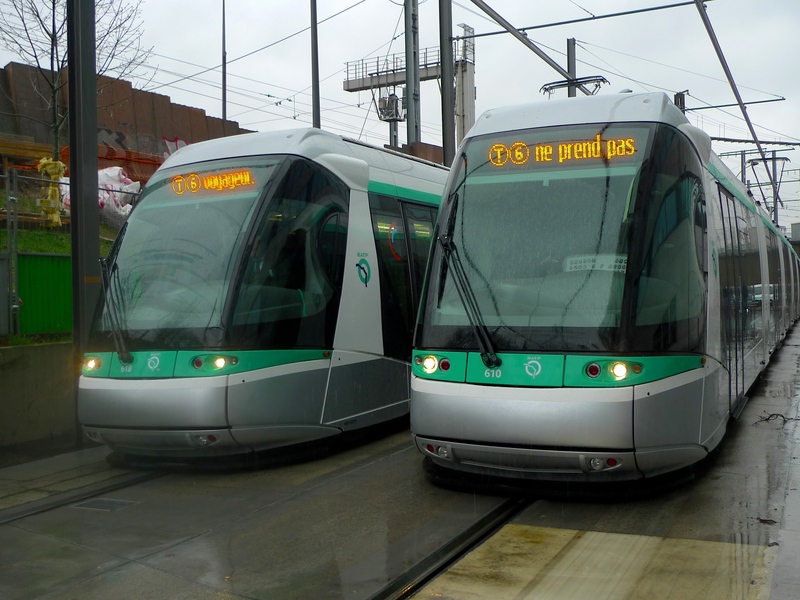 Tram Line T9 is the planned line between Paris Porte de Choisy and the city of Orly, expected in 2020, followed by Tram Line T10 from Antony to Clamart in the southwest suburbs of Paris, expected in 2021.